The TELESIS F-Series is a family of maintenance free Q-switched ytterbium fiber lasers specifically designed for marking applications with average power levels from 10-100W. These lasers deliver a high power laser beam directly to the marking head via a flexible metal sheathed fiber optic cable. The fiber based optical design and rugged mechanical design allows these markers to operate in an industrial environment where shock, vibration and dust are a concern. The F-Series fiber markers unique design allows the overall package to be very small and modular for ease of integration into a variety of industrial applications. 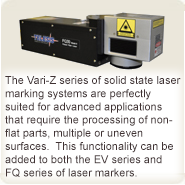 The F-Series Laser Marking Systems offers a best in class 100,000 hour MTBF diode reliability with no water cooling requirements, and only single phase 110/220VAC power requirements. The innovative, F2H PATENTED dual head pulsed fiber laser system is perfectly suited for advanced applications that require rapid processing over a wide range of materials. The dual head design of this laser offers the user the unique ability to control two fiber lasers with the same controller.